Bedtime can be a stressful time for parents if your child isn’t going to sleep when they should. It is a terrible way to end the day, and then the next day, everyone is more tired than they should be. While you may feel frustrated with your child about this, as the adult, the key to helping them sleep is to make changes. Chances are, you are falling prey to one of these common bedtime mistakes. The good news is, once you identify the source of the problem, you can take steps to solve it. 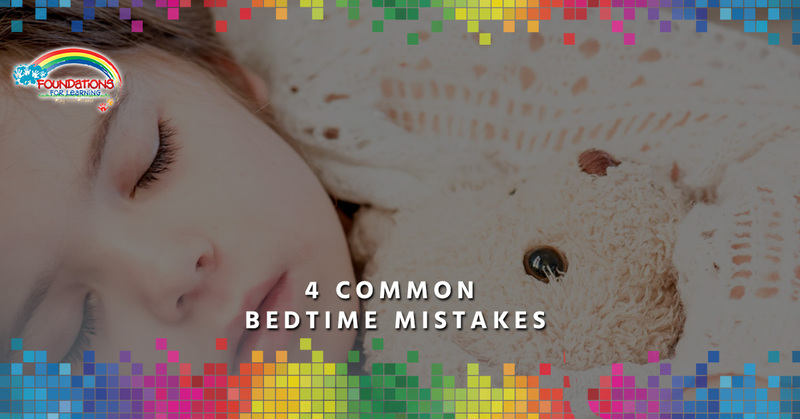 In this blog, we will go over the mistakes parents most commonly make when it comes to putting their kids to bed. If you go to bed at different times during the week, you might not have much of a bedtime routine yourself, and therefore, not really worry about a bedtime for your kids. However, having a routine is very beneficial for children. Doing the same thing before bed every night makes the brain associate that routine with sleep, promoting drowsiness. Help your child wind down before bed by dimming the lights, playing some soothing music, and reading a story. Do your kids bounce off the ceilings when it’s time for bed? This means they have excess energy that they did not have the opportunity to burn off during the day. If you want your kids to be tired for bed, they need the space to expend energy earlier. Make sure that, long before bedtime, your kids have active play time to move. It’s best to let them run outside, but if weather doesn’t permit, encourage active indoor activities. Dancing, playing tag, skipping, and jumping can all help burn off energy inside. When your kids can’t sleep, you want to be kind of them. However, if you offer rewards, it will encourage them to stay awake. Don’t give your kids treats of any kind when they wake up in the night. Also do not stay up with them and give them a lot of affection and attention; a quick, comforting hug should be sufficient to show that you care. Don’t allow playtime when your children should be asleep. Put them back to bed instead of letting them stay up. Consistency is big part of successful parenting. If you tell your kids that they have to go to bed in ten minutes or you won’t read them a bedtime story and then you don’t follow through, it puts them in charge. If you set a rule in place, make sure you follow through. Also be consistent in the routine, putting your kids to bed at the same time every night. Otherwise, they will become confused and not know how they are supposed to behave at bedtime. Positive reinforcement is more effective than punishment. One way you could use positive reinforcement is to allow your kids to stay up later on weekends than during the school week. Alternatively, you can use a point system that earns them certain privileges for good bedtime behavior. Bedtime is a struggle for many parents, but make sure that you aren’t making these classic mistakes, and you should have an easier time getting your child off to the land of Nod. If you need child care in Southington, contact Foundations for Learning today!